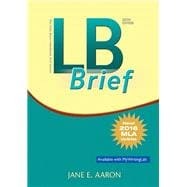 LB Brief, Sixth Edition helps students to find what they need — and to use what they find. This reliable reference merges the authority of its parent, The Little, Brown Handbook, with a more streamlined presentation. LB Brief maximizes that handbook’s strengths, while keeping pace with the rapid changes in writing and its teaching. It answers questions about the writing process, critical thinking, grammar and style, research writing, documentation, and more. With a cross-curricular outlook, easy-to-use format, and assumption of little or no experience with writing or handbooks, LB Brief is ideal for students of all interests and skill levels. Jane E. Aaron has taught writing at New York University and several other schools and is the author of eight successful and long-lived composition textbooks, including The Little, Brown Handbook and The Little, Brown Compact Handbook.